Preheat the oven to 160C. Prepare a 22cm cake tin by buttering the sides, lining the base with a disc of baking paper and buttering again, and finally dusting with caster sugar and flour. Separate the eggs. Beat the yolks and sugar together in an electric cake mixer until thick and mousse like. Add the lemon zest and juice and continue beating until the mixture forms a ribbon when lifted with a spoon. Carefully stir in the semolina and ground almonds with a metal spoon. Whisk the egg whites until they form peaks, then fold them carefully into the mixture. Turn at once into the prepared tin and bake for 30-40 minutes. 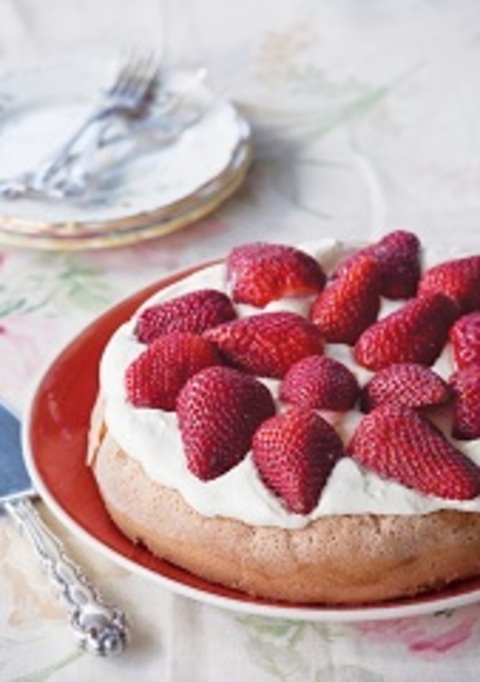 When cool, pile the whipped cream on top and cover with the sliced strawberries. Make the egg filling by plunging the eggs into rapidly boiling water to cook for 7-8 minutes. Immediately remove and plunge into icy cold water to cool rapidly. Peel the eggs and place in a bowl. Use a potato masher to crush the eggs and add the mustard powder, salt and pepper, 4-5 tablespoons of the mayonnaise and the parsley. Mix well so the eggs are well mashed and not too chunky. Divide the egg onto seven portions and spread over seven pieces of the bread. Top each with a second slice. Lightly spread the upper side of these pieces of bread with mustard and place slices of ham on the mustard-spread bread. Finally spread the remaining seven slices of bread with mayonnaise and press lightly onto the ham. Take a very sharp knife and cut the crusts off each side of each sandwich. Cut each sandwich into three fingers and place on a sandwich plate. Cover with cling-film wrap and then with a wet tea-towel until ready to serve. This story was published in my FOOD column in the Listener last week with the genius recipe for Angus Eye Fillet of Beef. New Zealand grows grass in abundance; grass that feeds cattle and sheep to make our processed beef and lamb world-class. So itâ€™s disturbing to hear that farming forecasters this week predicted that the impact of this summerâ€™s long drought will result in a $1 billion loss to our economy. In such a difficult season, North Auckland farmers, Chris and Karryn Biddles overcame the lack of growth in their paddocks, producing consistently tasty tender beef to win the 2013 Steak of Origin challenge. This competition organised by Beef and Lamb, the marketing arm of our meat industry, aims to find the most tender and tasty sirloin steak in New Zealand. It is open to beef farmers, retailers, wholesalers and foodservice suppliers. The competition process involves an initial assessment of the sirloin steak at Carne Technologies in Cambridge, where each steak is aged for three weeks before being tested for tenderness, pH, marbling and % cooking loss. The most tender sirloin steaks went on to tasting tests, and at the Grand Final the judging criteria for the twenty finalists included measuring aroma, texture, flavour, tenderness and juiciness. The Biddles have been regular winners with their beef, having been named NZ Producer of the Decade in 2012. Their farm, Te Atarangi Stud is at Te Kopuru on the stretch of coastline southwest of Dargaville. Chris Biddles credits his wife Karren for finishing the cattle to what he calls â€˜rising healthâ€™ by moving them around every day or two to eat the best of the grass. The northern kikuyu grass, regarded as a nuisance by many, combined with chicory and plantain grasses makes for delicious steak thatâ€™s not too fatty. What surprised many other farmers was the winning entry was an Angus/Jersey cross. Biddles commented that some stud breeders around New Zealand â€œdonâ€™t approve of dairy cross beef.â€ It would seem, however that the proof is in the eating. I asked the Biddles about their own favourite choice cuts of beef, and they agreed the front end of the animal is the tastiest. Those cuts, for Karrynâ€™s long slowly braised casseroles with garlic, onions and vegetables, are firm family favourites. The celebration prize-giving dinner was hosted by the Beef Expo in Feilding and served in the exposition hall by caterer Hester Guy and her team from Palmerston North. Lowing cattle and the accompany smells added to the country atmosphere. It was beefy meal with a tasting platter of beef treats, followed by marshmallow-soft eye fillet from the competition entrants. Meanwhile peel the red onions, leaving the root end attached. Cut each onion into 6 wedges. Toss into a roasting pan with 2 tablespoons balsamic and a sprinkling of brown sugar. Season with salt and pepper and roast for 30 minutes until the onions are tender but not too darkly caramelised. Keep aside. Peel the beetroot, cut into segments and toss in second roasting pan with remaining balsamic, olive oil, brown sugar, salt and pepper to season and some of the thyme leaves. Roast for about 15 minutes, tossing a couple of times. Allow to cool. Combine the beetroot and onions in one pan, tossing carefully and cover with foil. Reduce the heat in the oven to 160Â°C and reheat for 15 minutes when ready to serve with the eye fillet. To cook the eye fillet, season with a little extra olive oil, salt and pepper and the remaining thyme leaves. Heat a heavy frying pan and sear the meat on all sides. You may like to add a little extra olive oil to the pan. Once the meat is browned, place the pan in the oven for 10 minutes. Remove the beef, cover well with foil and a tea towel so the beef remains hot. Leave to rest for at least 10 minutes, then carve into neat slices and accompany with the red onion and beetroot mixture. Many people steam the shellfish open, grinding or chopping the meat before adding it to the batter. I find those fried fritters with their twice-cooked meat can be pretty tough. Years ago my mother shared a tip with me to get around this. She puts her pipis, once purged, into the freezer for at least two hours. When she takes them out they pop open as they defrost and the raw meat is easy to remove and far better for adding to the fritters or soup. If using the vacuum-packed Cloudy Bay surf clams, remove from the packet and split them open through the hinge of the shell. (If using freshly gathered clams, see notes above.) Remove all the meat and the juices to the food processor. Briefly pulse the clams to chop them roughly. Melt 2 tablespoons of the butter in a frying pan and add the chopped onion and cumin. Fry gently until golden. Beat the eggs, add the flour and the cooled onion and mix well. Add the reserved clam meat with the lemon zest and herbs. Season with black pepper. To cook the fritters, heat the oil with the remaining butter and when hot drop about a tablespoon of the batter into the pan. Cook about 4 or 5 at a time, turning over after three minutes to cook the other side. Remove to a paper towel and keep the fritters warm. Serve with classic tartare sauce. Makes about 10-12 fritters. Serve with ice cold lager. Make a mayonnaise by placing the egg, 1 tsp of Dijon mustard, the lemon juice and a little salt and black pepper in the food processor. Whizz together and then slowly pour in the oils through the feed tube with the motor running. Remove to a bowl and stir in the chopped tarragon, rinsed capers and chopped gherkins, the chopped parsley. Season to taste. Cook the pasta and while that's simmering, cook the peas and drain well. Place the yoghurt, and half the peas in the food processor and blitz until creamy smooth and pale green. Add half the oilve oil and mix well.Keep aside. Heat the remaining olive oil in a small frying pan, add the pinenuts and chilli flakes and cook gently for two minutes. Drain the pasta, toss into a bowl with the yogurt and pea sauce and toss well together so the pasta is coated. Reheat the remaining peas with the lamb in the fryingpan with the pinenuts. Toss this with the pasta. Divide amongst four bowls and finally strew the torn or chopped basil leaves and the crumbled feta over. Season with black pepper and a little salt if necessary. Serves 4 as an entree. You can find these Cloudy Bay clams on line at www.cloudybayclams.com or from fresh seawater tanks at Seafood Harbour in Newmarket's Rialto Arcade in Teed St. Or try this with freshly gathered tuatuas at your favourite surf beach. Open the packets of clams and keep aside with juices. Take a large pot of salted hot water, bring to the boil and when simmering add the pasta. Cook for 8-11 minutes until tender and drain through a colander. Meanwhile, in a very large frying pan or sautee dish, heat the olive oil and ad the garlic, fennel and carrot. Cook, stirring rapidly over medium heat until soft. Add the wine, tomatoes and chilli and bring to a simmer, add the clams with any juices and cook over high heat until all the clams open. Throw in the parsley and butter with the drained linguine. Toss well together, add lots of extra black pepper and serve at once with a fresh green salad. Trim any excess flaps of fat from the duck breasts. With a very sharp knife score the skin of each duck breast to make a diamond pattern. Generously season each side with salt and pepper. Place the duck breasts, skin side down in a heavy based frying pan, and place over a moderate heat. There is no need to oil the pan as the fat will immediately start to run from the duck. Turn the heat to low and allow the duck to cook gently for about 10-12 minutes. Once the skin is crisp and golden turn the duck breasts over and continue to cook on the meaty side for a further 2 minutes. The meat should be nicely rare. Remove from the pan and keep the duck breasts covered in a warm place to rest for at least 5 minutes before serving. There will be at least one cup of fat in the pan, so store this in a container and when cool, refrigerate. The duck fat can be used to roast delicious potatoes and keeps for months if refrigerated. To make the sauce, put the chopped onion and butter in a small saucepan over low heat. Cook gently until the onion is golden and soft. Stir in the flour and continue to cook until the flour is golden. Add the stock, red wine, orange zest and juice and stir while bringing to the boil. Allow the sauce to simmer for at least 10 minutes so it reduces and becomes syrupy. Add the balsamic and cherries and cook for a further minute. This dessert is a variation on bread and butter pudding, made with sliced almond filled croissants from French baker Paneton. Traditionally French bakers would stuff almond paste into their left-over croissants, and rebake them for sale next day. Paneton, an Auckland wholesale bakery, make their almond croissants fresh every day, and they’ve become their hero product. If you can’t find almond croissants, use classic croissants and scatter over 2 tablespoons of ground almonds. I have used fresh sliced Angelys pears with lemon rind and juice for extra flavour and balance in the pudding. If you’re serving this for a dinner party prepare everything ahead of time, and just before you sit down to dinner, pour the vanilla-scented custard over the prepared croissant and pear mixture and pop it in the oven. It will happily bake while you’re eating. Preheat the oven to 180°C. Place the vanilla bean and sugar in the combined cream and milk. Bring to simmering point then turn off the heat and leave to stand for 30 minutes to infuse with the vanilla flavour. Meanwhile, place the sliced croissants in a well buttered attractive ovenproof baking dish, overlapping the slices. Sprinkle the pears with the lemon juice and zest, and then add them to the croissants, tucking them in between the slices. Add the strained, infused milk and cream to the eggs. Beat well then pour over the croissants and pears. Bake for 30-40 minutes until the custard is set and the pudding is puffy and golden. 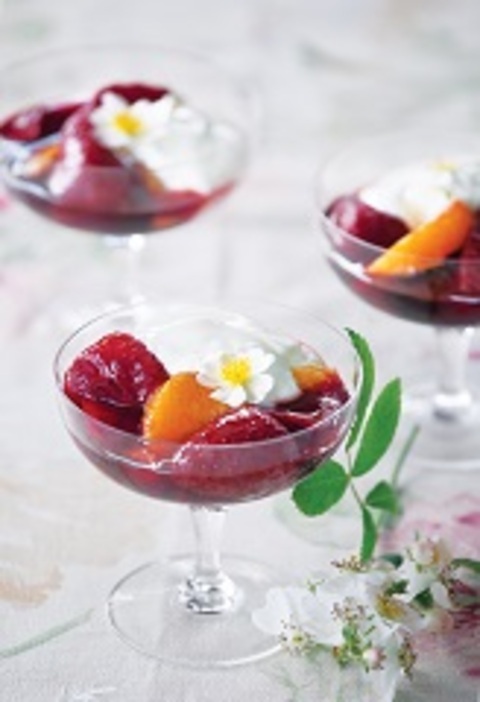 Serve immediately with yoghurt or whipped cream. Wellington cheesemaker Zany Zeus has produced a range of smoked cheese products. They yet to hit the market but I am lucky enough to have scored a pottle of the smoked ricotta at the Food Show. It's amazing. Soft, smoky, salty and sweet. Arrange everything artfully on the plate. Drizzle over the lemon juice, olive oil and season to taste with salt and pepper. Serve at once with crusty bread as a luncheon dish. Serves 2.